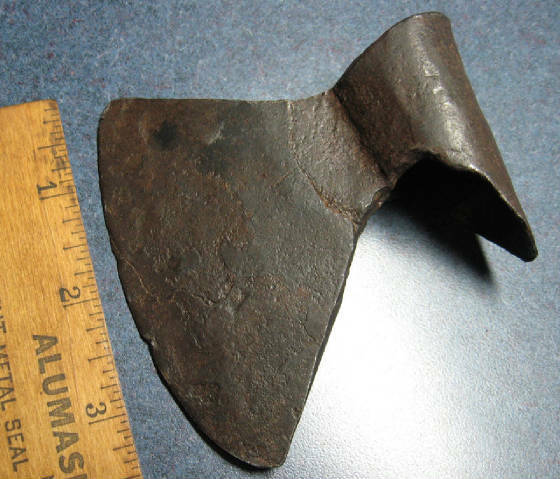 Here is a bat wing tomahawk fake (sometimes these are referred to as 'bell flower' cutouts) that was sold as authentic. 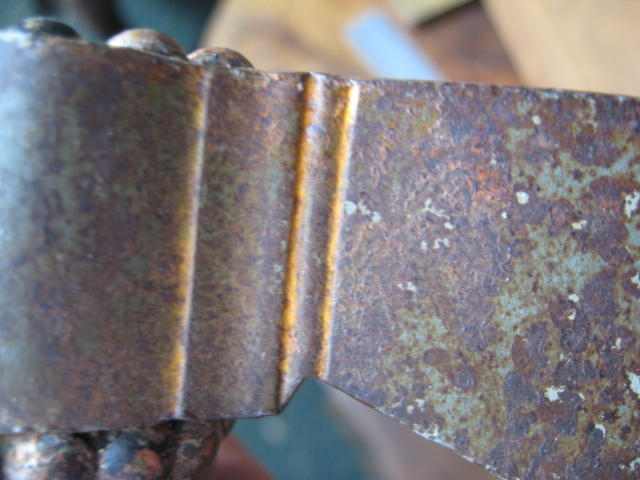 This example clearly has no patina and was probably laser cut by machine. The haft is clearly stained and the tacks & head have virtually no patina. Yet they continue to sell for hundreds or thousands of dollars more than they are worth. They also are still hand forging and cutting these out by hand to sell as authentic, from as far away as the Czech Republic & Poland. While this is an early to mid 20th. 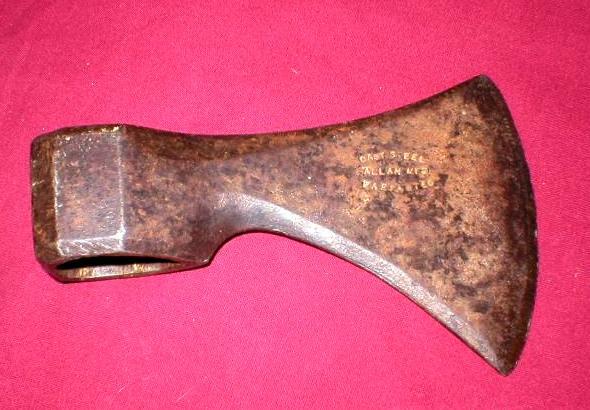 C. axe made in France it was used for general carpentry for centuries and never exported to America during the fur trade period. That doesn't stop many of these from arriving on our shores in recent years to be reincarnated as Indian trade tomahawks. In fact they are still being made there. 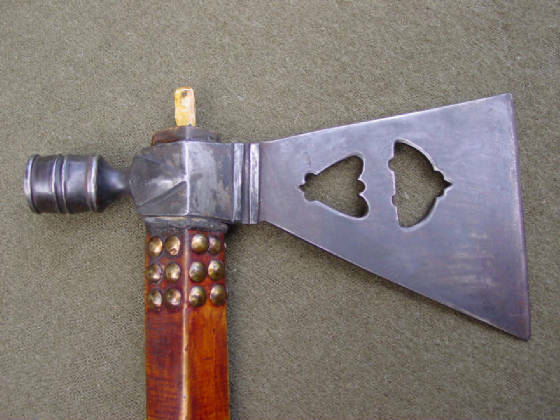 Some of these show up as French foreign legion sapper's axes. 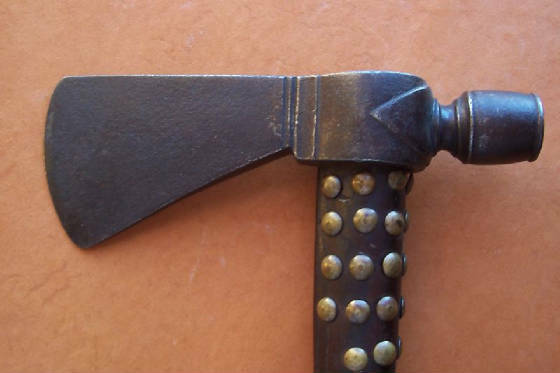 The French Sapper's were a branch of the early French army that used axes to destroy the barricades and entrenchments the enemy had built to stop the coming infantry. 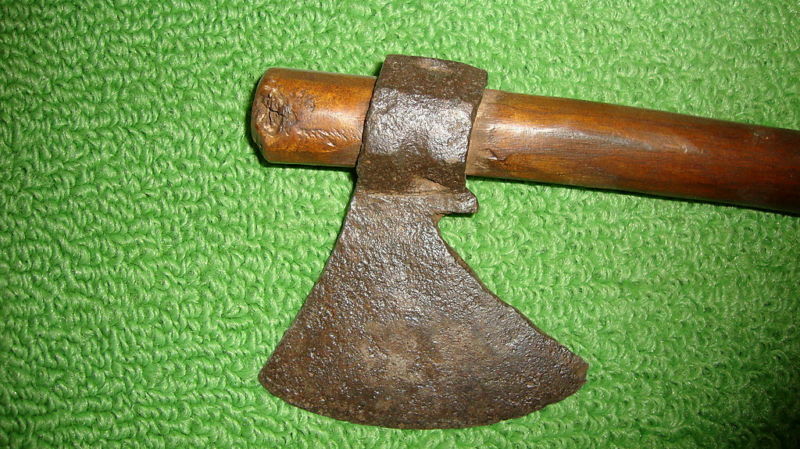 A Joseph Szilaski reproduction with his mark "S" inscribed on the head. Sometimes they obliterate the "S" so it can't be seen. 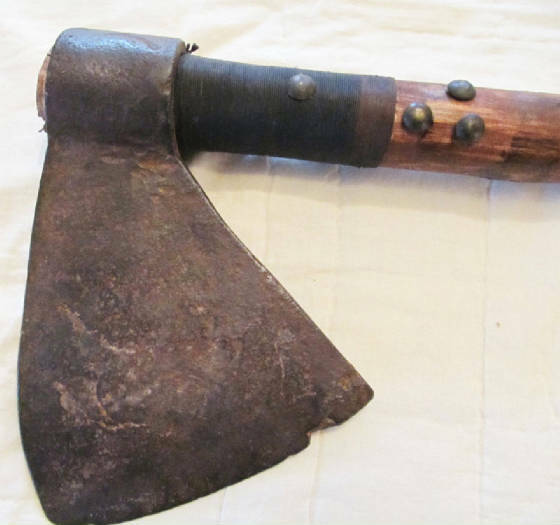 Several types of pipe tomahawks were cast from originals by Szilaski & sold as repros but now fakers have been adding rust/patina to them & selling them as originals, particularly on ebay. Since they are cast from an original one they can be very difficult to distinguish. This one was however doctored to look old and sold as authentic--one of many. Sometimes the S mark is ground off as well. HERE IT IS WITH MORE RUST ADDED. ENGLISH MODEL CAST FROM AN ORIGINAL BY SZILASKI--MANY HAVE BEEN SOLD AS ORIGINALS IN AUCTION HOUSES. THE MORE RECENT ONES HAVE A MORE SMOOTHED APPEARANCE DUE TO THE MOLDS WEARING OUT AFTER 25 YEARS. R.E. Davis sells these repros. among others, however they have been purchased in quantity by fakers who artificially age them. These next 6 examples of the English model are only of one type among the many varieties reproduced. Naturally cast iron & certainly not this 4140 cast steel alloy was ever used on tomahawks during the 18th and 19th C. Patina can be manipulated to many different shades, as can their handles. SAME AS ABOVE BUT ARTIFICIALLY "AGED". The next two axes show a before and after picture of a Carlos Gove reproduction. The first one is before it is 'aged' and sells for about $40. 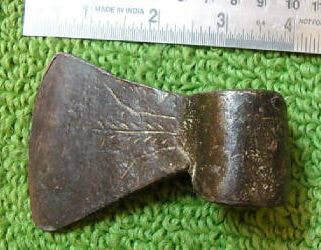 They never made spike tomahawks shaped like this during the trade period or made from railroad spikes. Even so, many people are convinced they are genuine simply because they are hand forged. 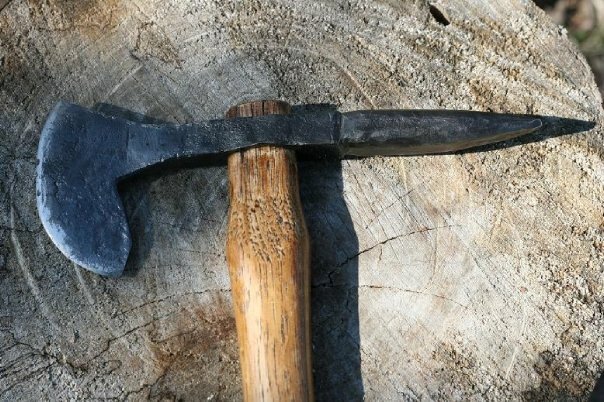 There are hundreds if not thousands of blacksmiths making tomahawks of all types throughout North America and the world. Most are never marked by their makers. 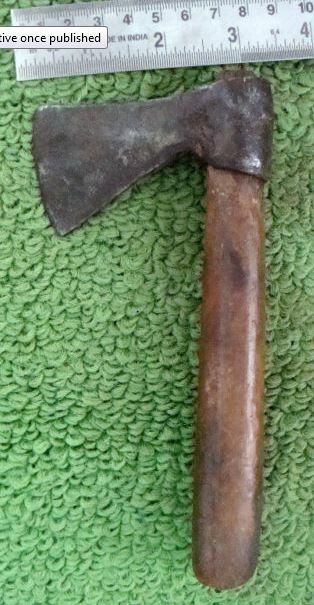 This axe made by Pete Allen (of Minnesota I think) has been making these of a high quality 4140 cast steel for decades however people have been dunking them in salt water & selling them as originals. 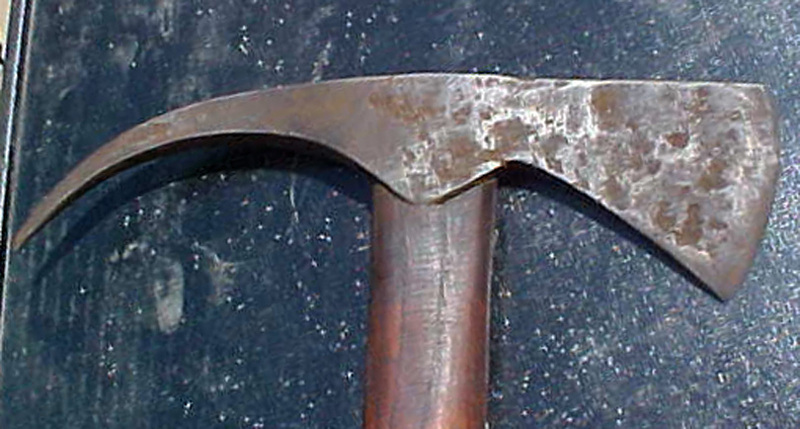 Original trade axes were never made of cast steel, never had facets on the poll, and always hand forged. One of these ended up in a book in Indian trade goods as authentic. A commonly sold repro sold as authentic. It was reportedly cast from an original. The have the chip in the same place in the repros. 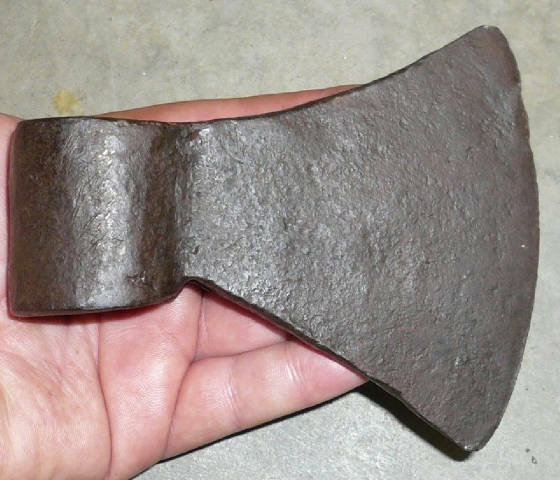 A great many 19th C. axes that were used in other countries are now being imported to the U.S. to sell as American Indian trade axes & tomahawks. Many of them are currently coming from India and Pakistan such as the the next 6 examples. 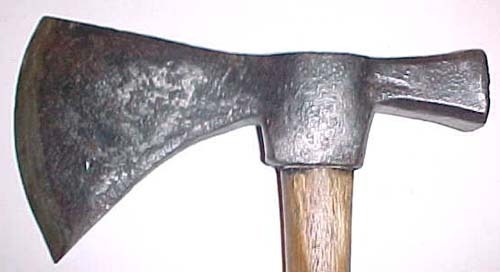 Naturally, neither the Middle East or Far Eastern countries never exported axes to the U.S. during the trade era. 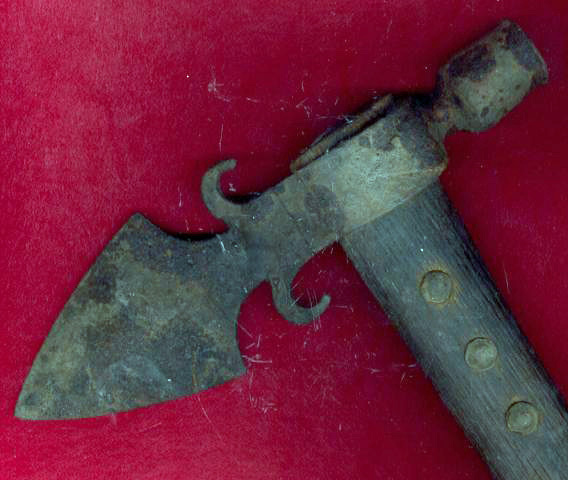 Just because it is old and has a round eye doesn't make it an American Indian tomahawk. Examples are below. There are many more. This cast head has been sold for decades in many reenactors catalogs usually for around 40 bucks or so. Here is one of the above "afterwards" that sold for over $1,000 after being tweaked. Some are tweaked with inlaying or additional engraving or file work. 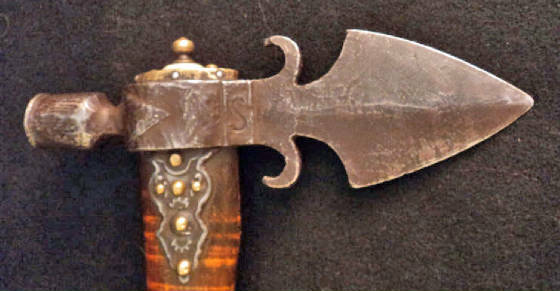 These are being hand forged & sold from MS. to CT. with fake dyed handles, some have polished tin plates on the handle saying 'Fort Union 1832'. I'm surprised it doesn't say Custer was scalped with this. There are hundreds of blacksmiths today hand forging tomahawks. It doesn't take much to add rust. All these fakes are sadly more the norm in auction houses, websites, shows, antique stores and malls. Some are in museums after they were unknowingly donated. They are the majority of what you see for sale but no one will ever convince most of their buyers or even some of their sellers. Here is a different one being hand forged in VA. which are being legitimately sold as reproductions. I guarantee some will be later resold as originals. Buy them for $80 & others sell them for hundreds...this is the unfortunate legacy of hundreds of well meaning reproduction blacksmiths. HERE IS ONE FROM AN OHIO REENACTOR SUPPLY HOUSE THAT WAS AGED. THESE ARE EASY TO CONFUSE WITH GENUINE ONES. 8 3/8" x 1 1/4". THIS ONE IS MADE BY THE THUNDER RIDGE TRADING CO. THE LIST GOES ON & ON & ON. By now it is probably clear that I have not given you ALL the answers as far as detecting what is a fake and what is not. I have just laid out some of the most basic characteristics every collector needs to be cognizant of when first starting out. Unfortunately I cannot say more or else the people faking them would then also learn how to make better fakes. Perhaps I have said too much already. The sad truth is that collecting Indian artifacts & tomahawks in particular is one of the most often faked collecting categories there is. They turn up in nearly all the major & minor auction houses and museums around the world. In the last 30 years tomahawk fakery has reached an all time peak with the con artists learning how to do them better & in far greater numbers. Not that I hold any ill will toward Southerners, but 90% of these fakes seem to originate from the Southern United States. So simply avoiding those states until you become more experienced (particularly on eBay) may dramatically improve your odds of getting an authentic one. That being said there are a couple dealers in Ohio that make a good living doing it as well. One tomahawk website that claimed to be helping others from fakes later had the owner admitting on his own forum he had sold cheap fakes on eBay bragging "you're lucky I didn't rip off more of ya" to his membership. Dealing with large reputable auction houses also does not guarantee you will avoid fakes either. Most of them have disclaimers stating "All sales are Final, AS IS", no warranty, no returns. 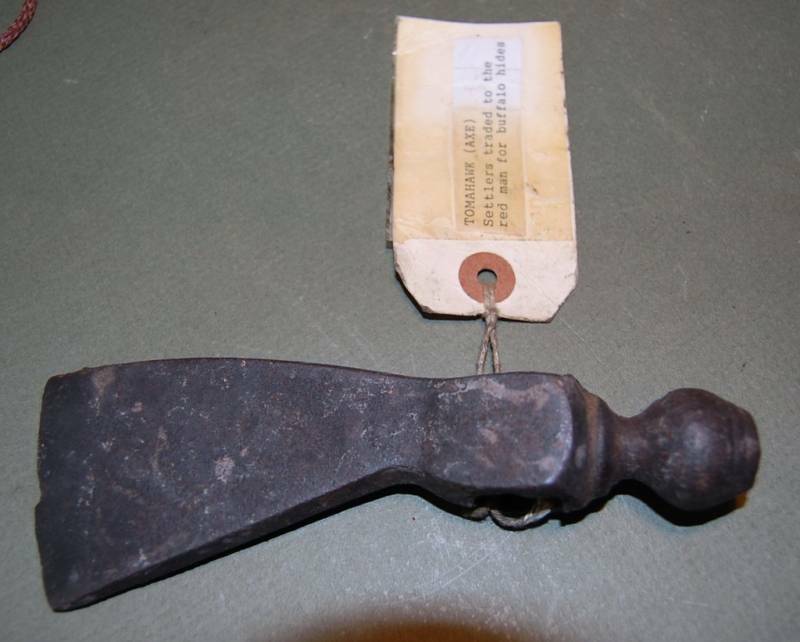 Many will conveniently identify items as simply a "tomahawk" with no speculation on it's date--they let the buyer read into it what they hope it is rather than identifying it as a reproduction. It works! Its a bit ironic that ebay's authenticity policy is better than most auction houses. Of course ebay may not necessarily enforce it but at least they have the policy. Even so, few buyers will seek out an expert to verify their purchase in the allotted time, if ever--and they know that! 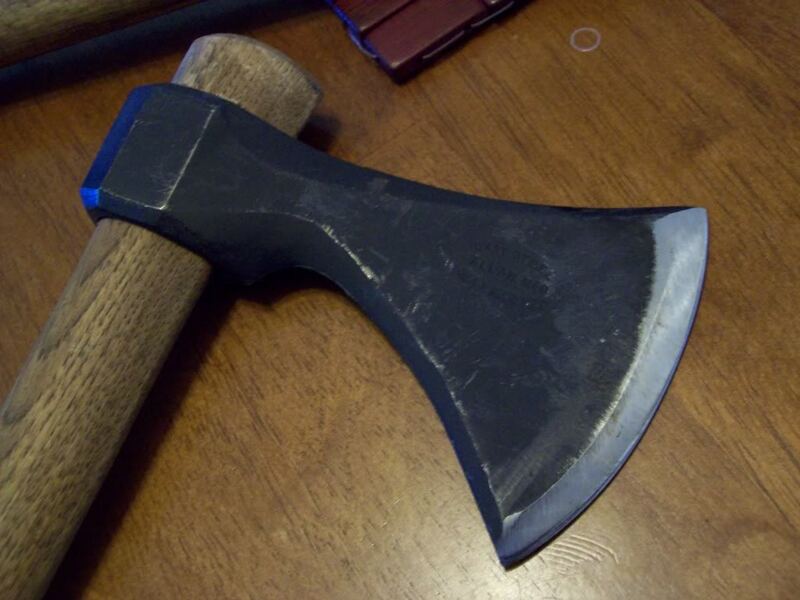 If you do buy a tomahawk from an auction house & find out its fake then you are usually just plain out of luck. I can't think of a single major auction house I have not found at least one fake being sold from at one time over the years. I guess it is unavoidable. Some certainly have far fewer problems than others and this can fluctuate with the particular advisors they have. "Where today are the Pequot? Where are the Narragansett, the Mohican, the Pokanoket, and many other once powerful tribes of our people? They have vanished before the avarice and the oppression of the White Man, as snow before a summer sun. "Will we let ourselves be destroyed in our turn without a struggle, give up our homes, our country bequeathed to us by the Great Spirit, the graves of our dead and everything that is dear and sacred to us? I know you will cry with me, 'Never! Never!'"